Whether you are an admirer of beautiful landscapes, an avid native plant gardener, or a lover of tropical plants, the North Carolina Zoo offers gardens you will enjoy. With exhibits spread across 500 acres, our state zoo in Asheboro (75 miles west of Raleigh) is one of the largest “natural habitat” zoos in the U.S. Over 40 horticulturalists are responsible for the natural-looking plantings in the exhibit areas. They have enhanced the Piedmont landscape with native plants adapted to existing growing conditions. Anyone with a sharp eye for native plants will note beautiful specimens tucked into the landscape. Formal gardens also abound at the zoo. A lovely garden of butterfly-attracting plants adorns the Kid Zone. And by early summer, the new honeybee exhibit will be enhanced by plants those pollinators love. You’ll also notice more formal plantings at the exhibit entrances. These mini-gardens are designed to be durable, colorful, and when possible, use plants that resemble those native to the animals’ environments. The entrances to the chimpanzee and gorilla exhibits use plants that resemble tropical plants but are hardy in the Piedmont, including Bigleaf Magnolia (Magnolia macrophylla), Windmill Palm (Trachycarpus fortunei), Sabal Palm (Sabal palmetto), Needle Palm (Rhapidophyllum hystrix), and Hardy Banana (Musa basjoo). Don’t miss the new wetland that adjoins the lake at the North American region’s parking lot. This feature is packed with native wetland plants designed to filter out pollutants that wash down from the parking lots before they reach the lake. Water-loving perennials such as iris, sedges, reeds, and even Jack-in-the-Pulpits (Arisaema triphyllum) grow happily beside water-loving shrubs like Buttonbush (Cephalanthus occidentalis). Among the R. J. Reynolds Forest Aviary’s 2000+ plants you’ll find exquisite orchids and other epiphytes like bromeliads and cacti perched comfortably on the limbs and trunks of tropical forest trees that include cacao, coffee, mahogany, bread fruit, and macadamia. Colorful tropical birds fly past, adding flashes of color and melodic calls. The former African Pavilion has been emptied of most of its animals and renamed the Tropical Plant Walk. About 80% of the plants here are from Africa. Most of the plants are less colorful due to the lower light conditions and include both exotic and familiar relatives of houseplants like Dracaena and Sansevieria. Garden clubs and other groups with special interests in gardening can make advance arrangements with the zoo’s horticulture staff to tour specific garden features. 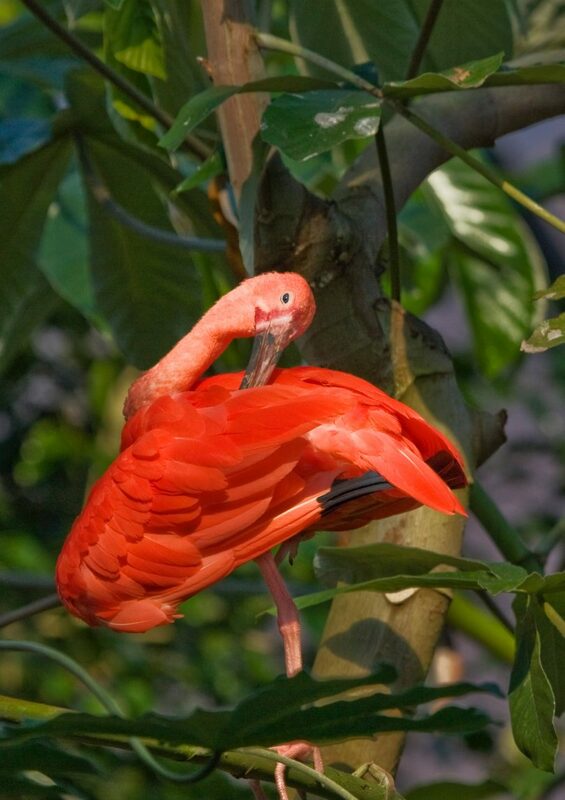 On-line tours of the Tropical Plant Walk and the R. J. Reynolds Aviary are available via the zoo’s web site. For hours, admission, and other useful information, visit www.nczoo.org. Catherine Bollinger has been a Triangle gardener for over 40 years. She visits the NC Zoo’s gardens (and animals) as often as she can.